Here is Taylor, (our Junior stylist) clean face..freckles, fresh pink skin..adorable without a stitch of make up on, but lets see how Baremineral's looks on her. 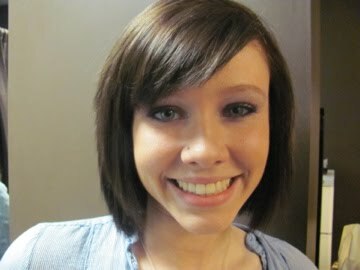 Now here below, her after picture...still looks fresh, doesn't even look like she has tons of make up on. Bareminerals is the most natural looking make up, it just can't be beat! Her skin looks flawless, any teeny tiny imperfections she had, are gone.